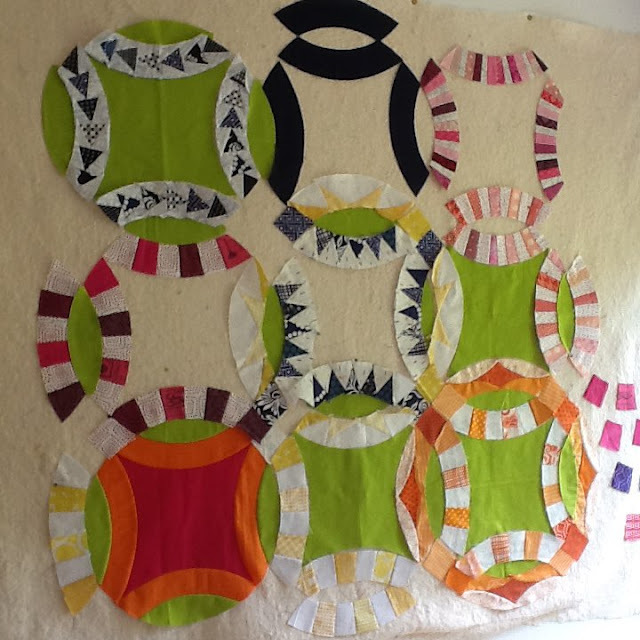 You may be a fan of Karen's hand screen printed fabrics already but the hot news is the reveal of the 75 prints she has in a collection for Robert Kaufman. 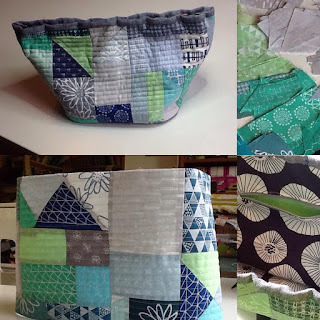 This works extremely well as a partnership as Karen has been printing on Kona cotton for quite a while. I should know as I have been buying from her for a long time! I love working with blender fabrics - most of my stash are just that and Karen's are too. It makes them easy to use in any project and of course they work so well together. So this week - dubbed 'a week of KLT' by me - I thought I could celebrate with Karen and post some photos of projects past and present. 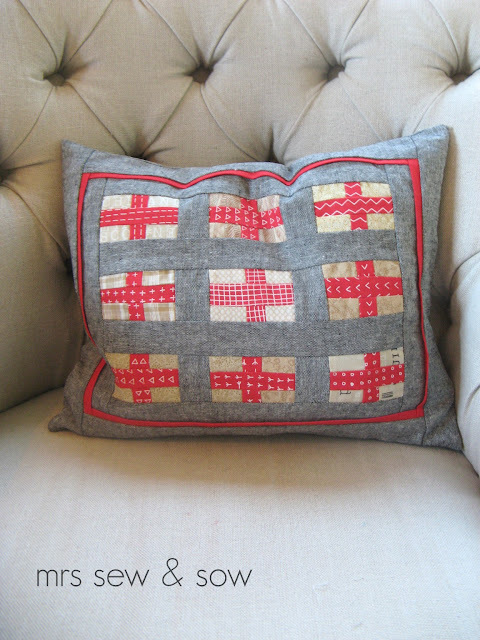 my lovely cushion with just one of Karen's fabrics though it has several different patterns on it! 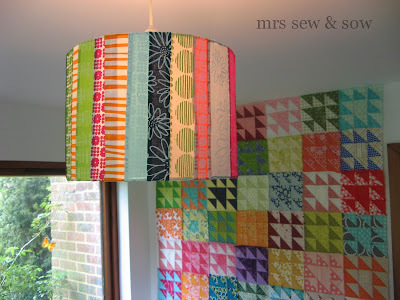 One of the lampshades I made for my sewing room - I just love that I see a range of Karen's fabrics just by walking in and don't they look great all lit up!? 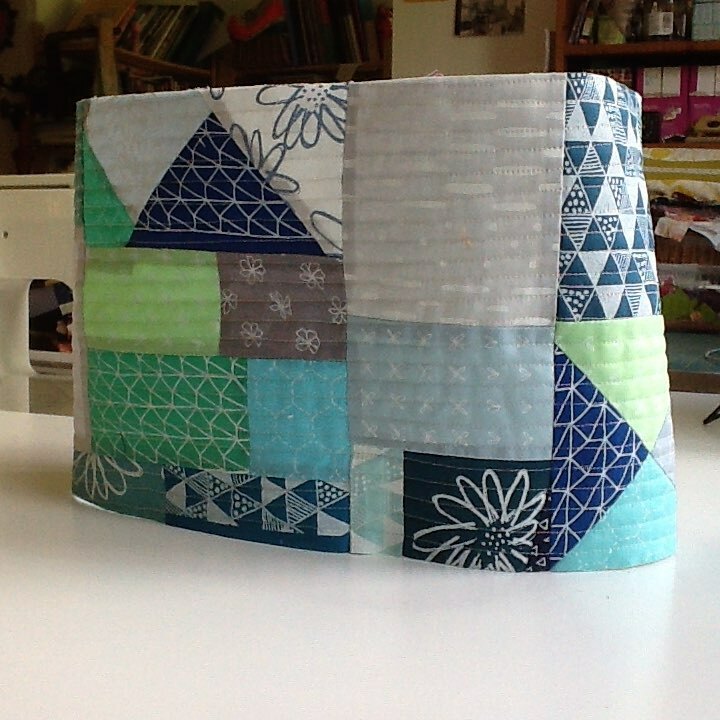 A quilted tray - I didn't quite follow the pattern from the book...but I teamed Karen's fabrics up with some thirties repro and think it will be useful for my handstitching projects in front of the TV.. 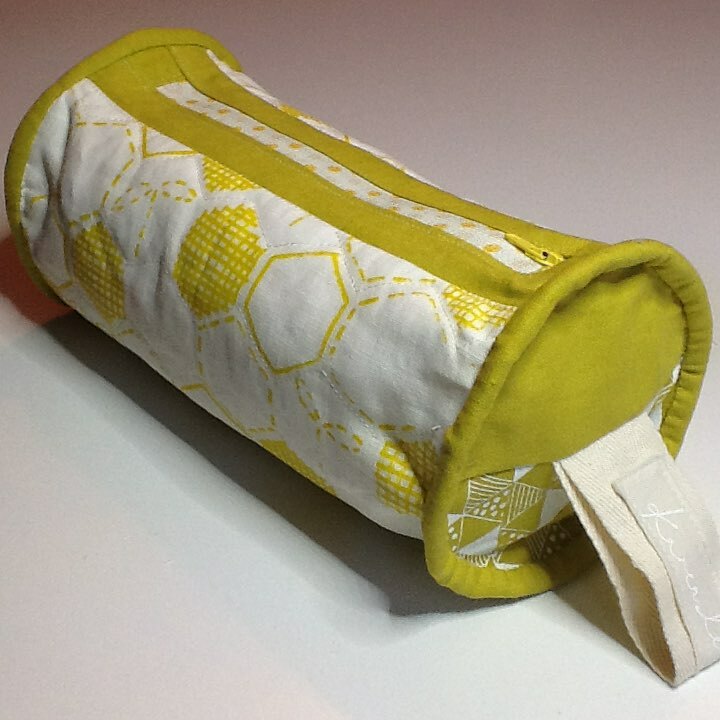 I came across a 'vintage' print by Karen and decided I would use it all up in a barrel shaped pouch. 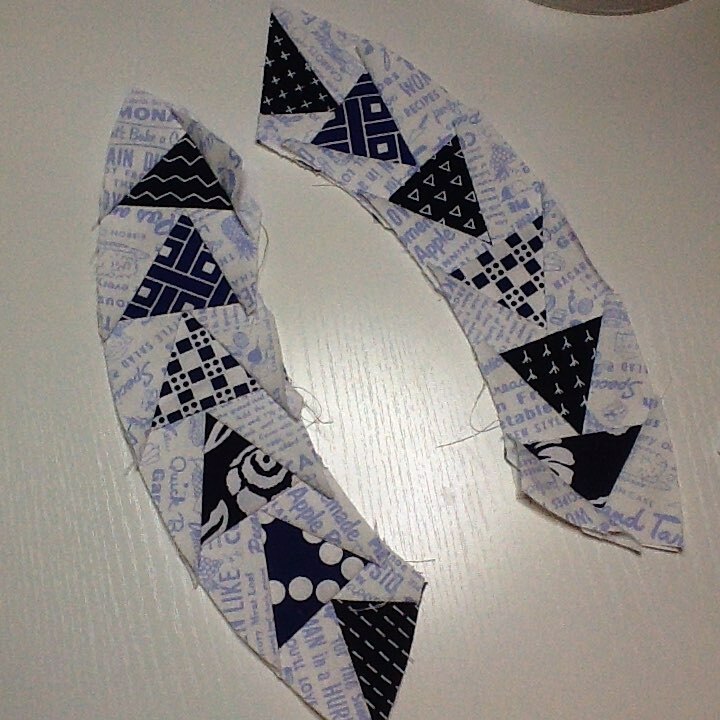 I even added a bit of her trianglemania fabric on the ends and her signature on the loop at the end! Oh dear now she might think it is hers!? I am thinking it will be great for holding rotary cutters and large scissors as it is quite roomy at 10" x 4.5"
Next I wanted to sort out all the scrappy bits which are left over from bigger projects and I found a pleasing colour way to play with. I'll be working on it some more later in the week - next job is to add the bottom to the lining but I am considering adding a magnetic snap and leather straps! So I may leave it as is till I figure out how this needs to be finished off. Pleased with it so far though. No I'm not on commission from Karen nor Robert Kaufman.....sadly not! July has been a slothful month for me so far. The kids are on holiday and I think I have been too. 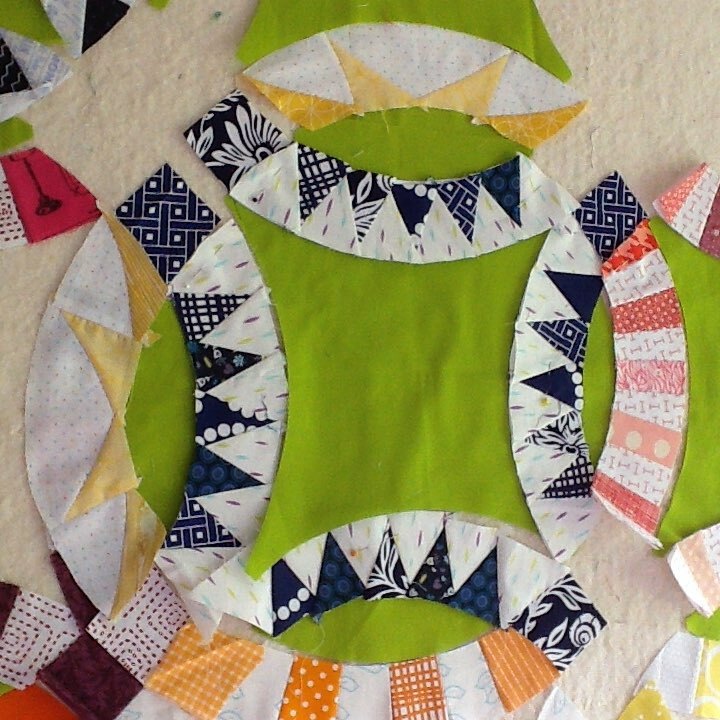 But I am gearing up for some progress on my double wedding ring quilt with an arrival anyday now of my background fabric - I'll be needing a lot! So much fun and totally legal - aren't we lucky!? 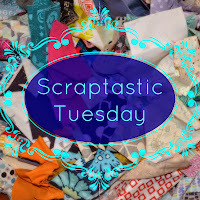 Thank you all for the inspiring scrappy links and congratulations to all the winners, we will email you over the course of Tuesday to get you connected to your prizes. Now I know Leanne is busy packing up her house and flying to the far north to teach but I'm wondering if she has had a scrap of time for some scrappy piecing? 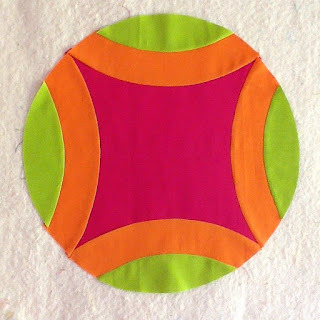 I have been working on a project for Simply Solids - the project - or rather projects are finished - and I am writing the tutorial, not helped by slow internet (there are now four of us in the house) and an overheating laptop ! I also have a sore knee - no really I do! Old injury come back to haunt me - it hurts to walk on but if I don't then it really hurts when I do! Got to keep moving - a little! None of the above helps but I am not going to complain anymore but share my most recent progress on my Double Wedding Ring quilt! Yeah! 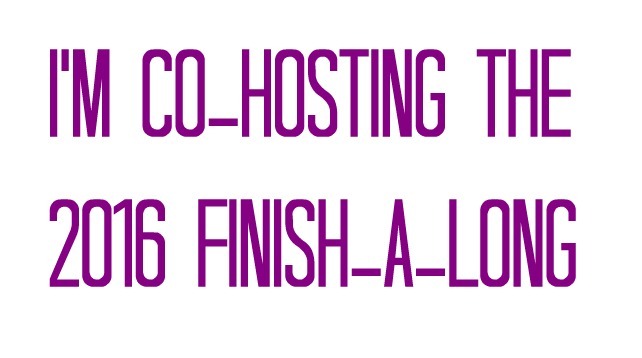 The sort of plan....but I'm already deviating from it! 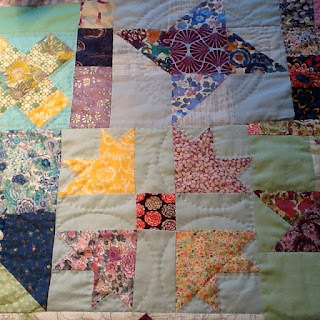 The colours are not right BTW I just couldn't be bothered to change those tiny triangles - it seems to be pink, orange, navy, yellow and green so far. Lots of green! 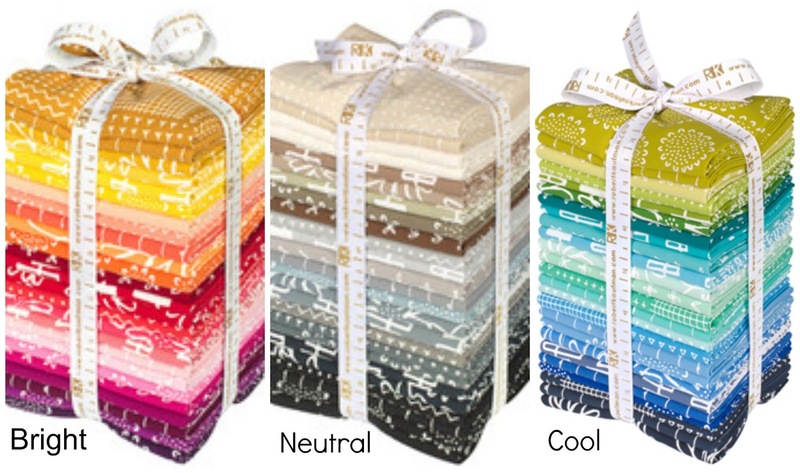 Not sure if they will all get made but some will....as I am mixing up the style and scale of my arcs I may be satisfied with just one arc of each?! Trudi, Jude and I are looking for company along the way of our casual, relaxed quiltalong. Care to join us? You can join with an old project or new! You can join with a big project or a small one - we don't mind! But we will be cheering from the middle of our own projects. Trudi has started on a big melon variation and I'm mixing up different pickle dish/DWR blocks and who knows what. We have yet to see what Jude has in mind. 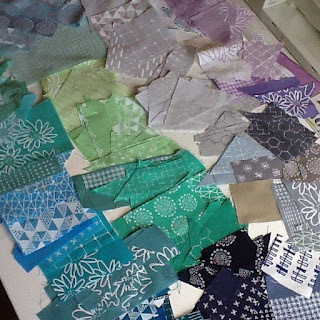 But now let us not forget our scraps! 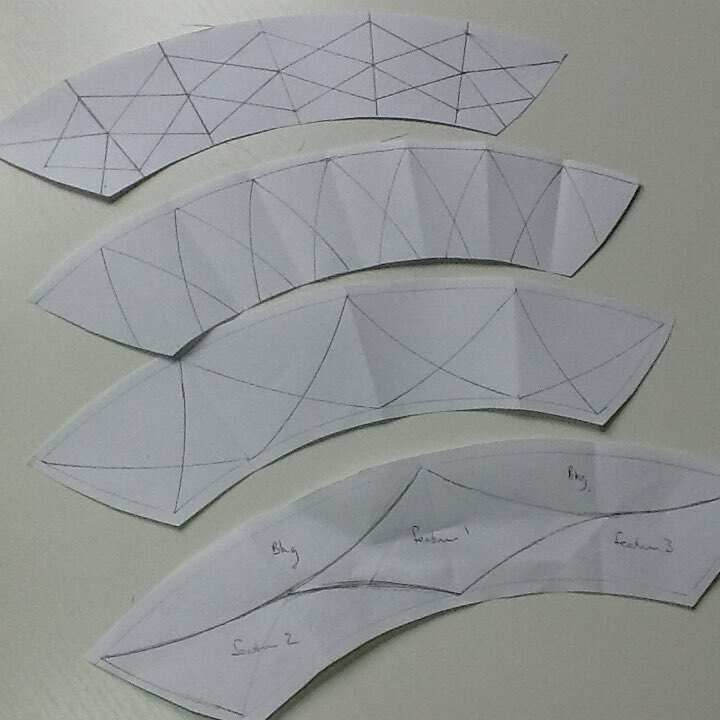 I've been using mine to make my arcs what have you been doing? My goodness it is Quarter Three already! Can you believe it? Quarter 2 worked so well for me that I am chucking everything into Quarter 3 and who knows what will happen. 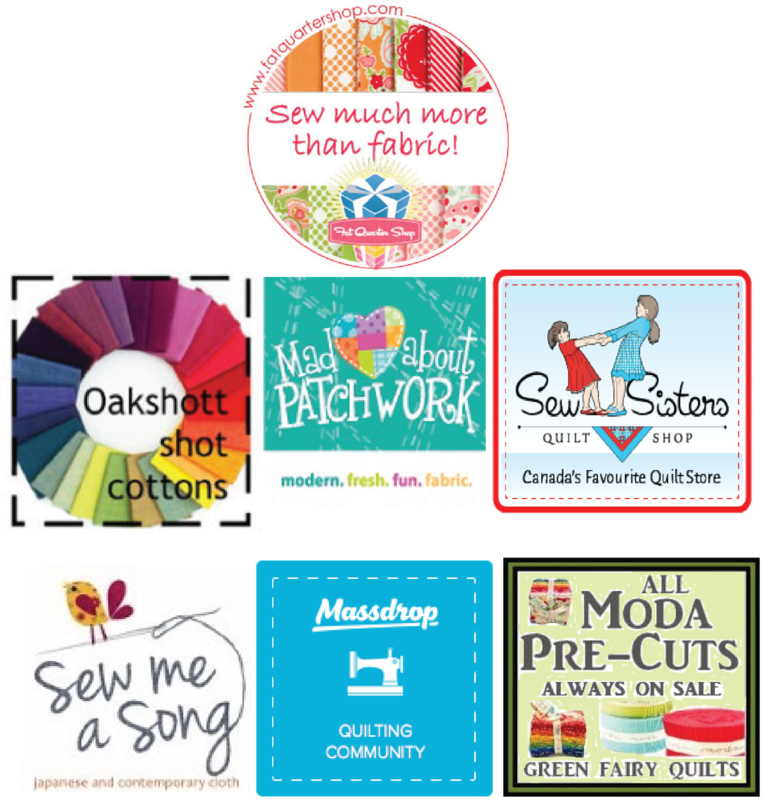 I already feel I peeked in Q2, getting nine of my sixteen FAL projects completed plus a further 7 quilts finished, though 2 I just quilted ! I am exhausted just thinking about it. Nevertheless nothing ventured, nothing gained, so here is another long list! 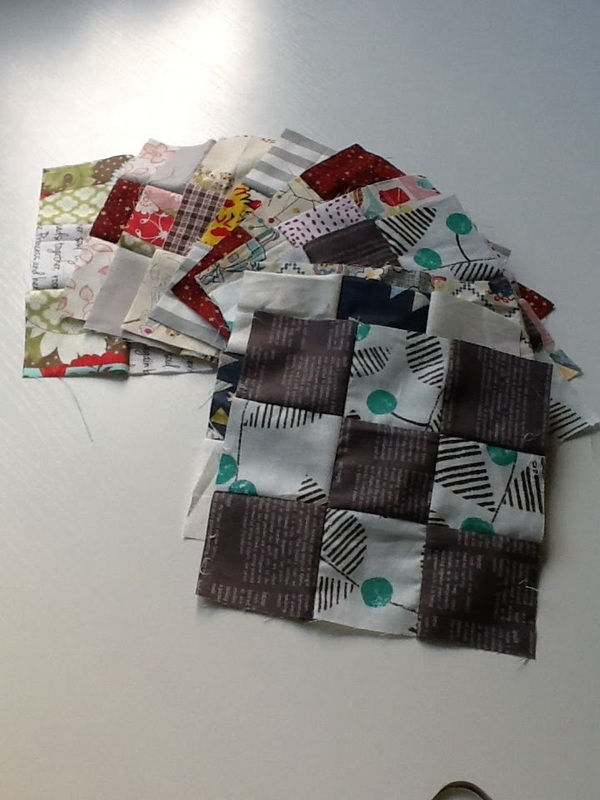 My rollover projects from Q1 (only two of those - which I hope to prioritise) and Q2- hardly started those! Too busy with those Siblings Together quilts. 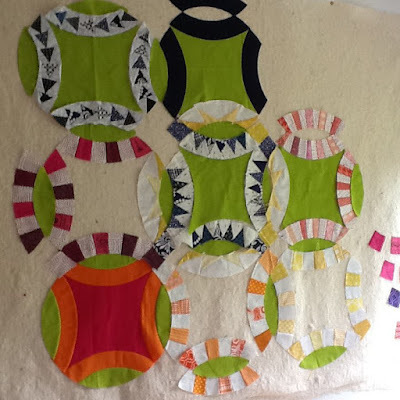 So I'm committed to making eight quilts at least for Siblings Together already in 2015/16, not including any bee projects...that should keep me busy don't you think? 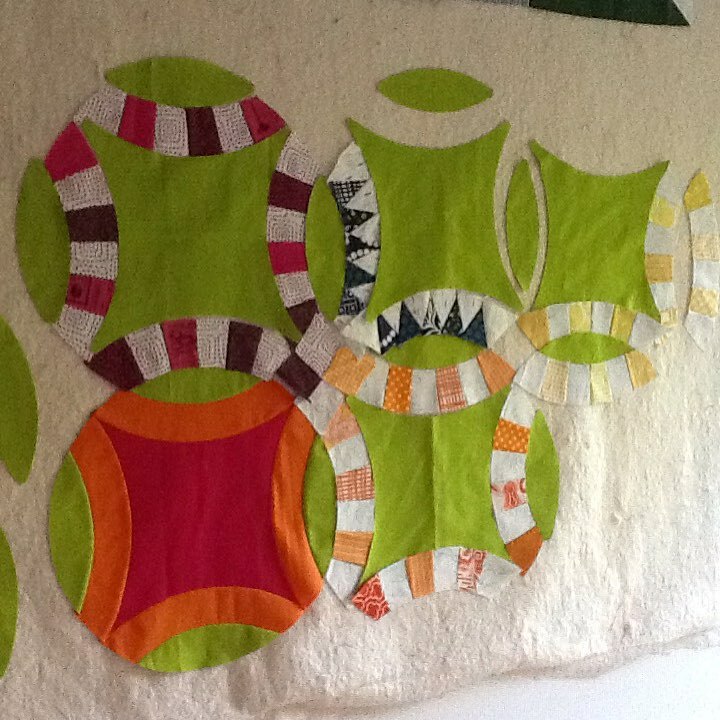 Have to say I am enjoying myself a lot with my new project; my Double Wedding Ring mixed up quilt. Nine Patches - don't know whether they will be used to make something else like stars or just used as nine patches plain and simple! 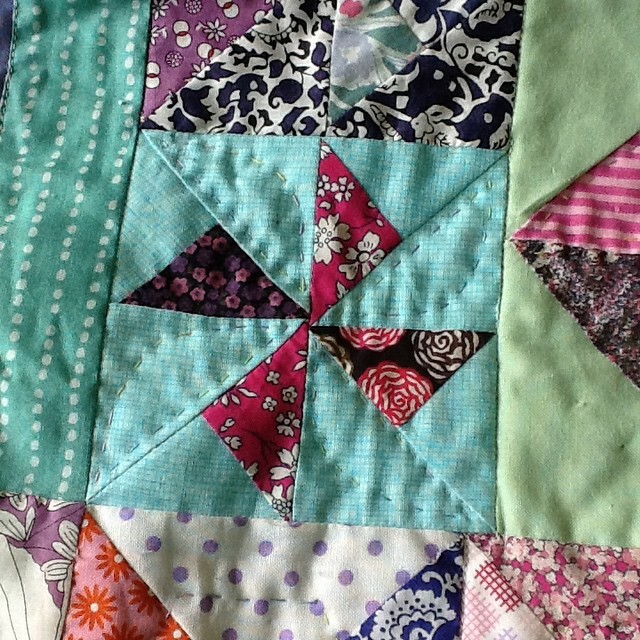 I may have a few donated projects to finish off for Siblings Together - they count as scrappy too don't they? 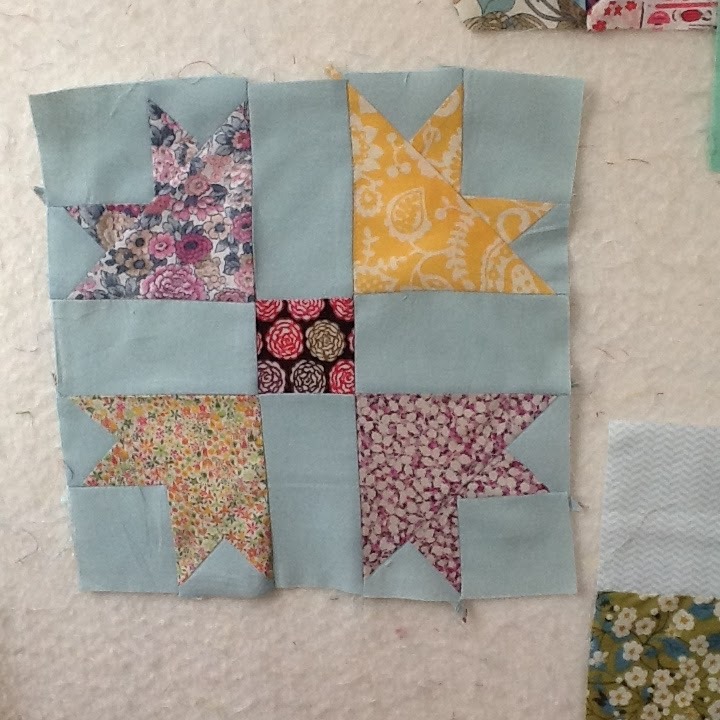 Blocks from Gayle, Helen, Catherine and Amanda. 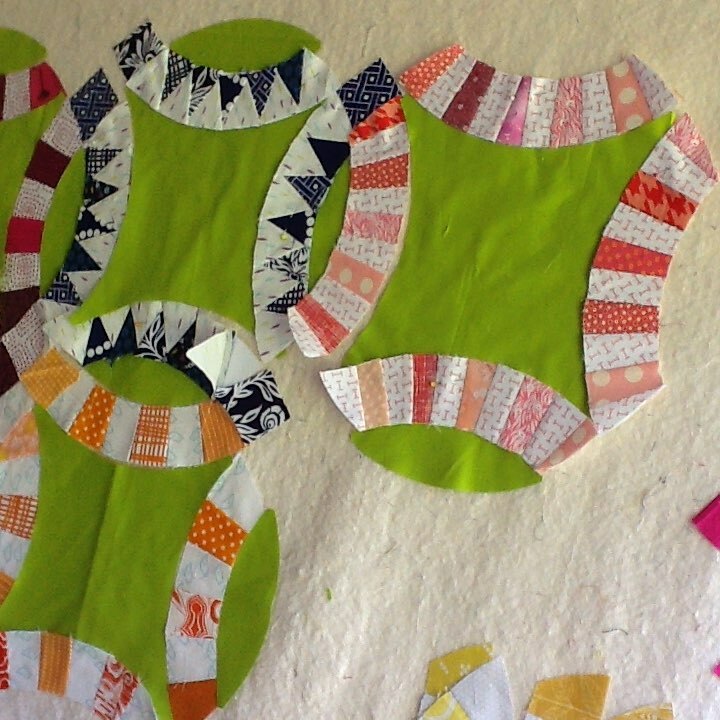 But my new, new scrappy project is a Double Wedding Ring/Pickle Dish variation quilt. I have wanted to make one for ages. 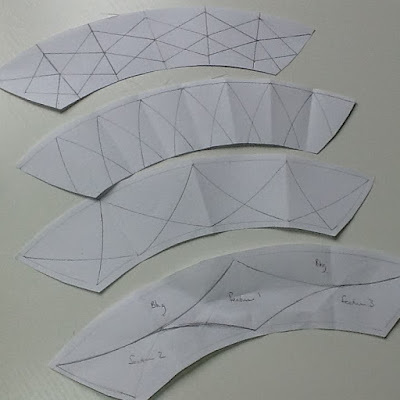 I used to think making one of these was the pinnacle of achievement! Now I'm not so sure...... think there are even more complicated things out there! 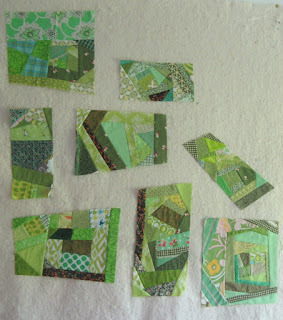 And this is my progress so far...big blocks 12" finished so they are going together quite easily! 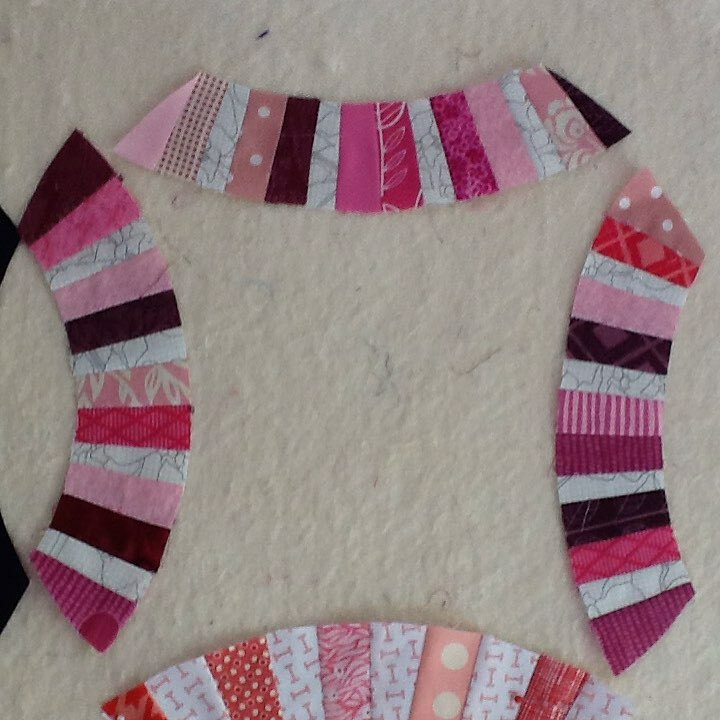 I think I can put lots of scraps into these arcs though the background isn't scrap! Bit of a hybrid project really. 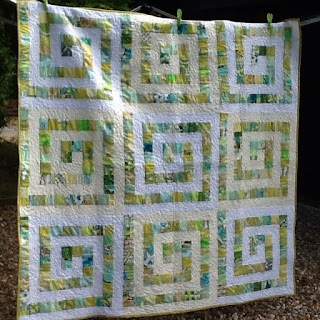 Really no idea why this quilt wasn't shared on my blog when I finished it!? Well I did show it in this post, but I didn't give it the full story! 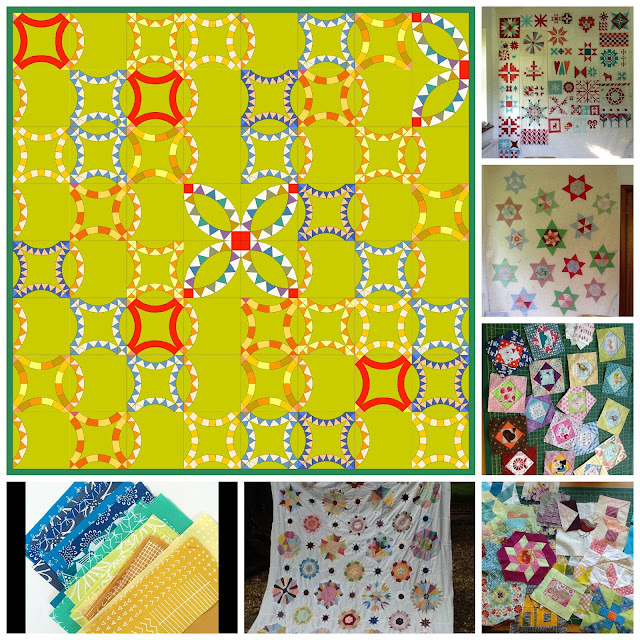 When Leanne and I started out on our #Scraptastictuesday linky party adventure in October 2014 I decided I wanted to make a scrappy sort of Liberty sampler quilt. 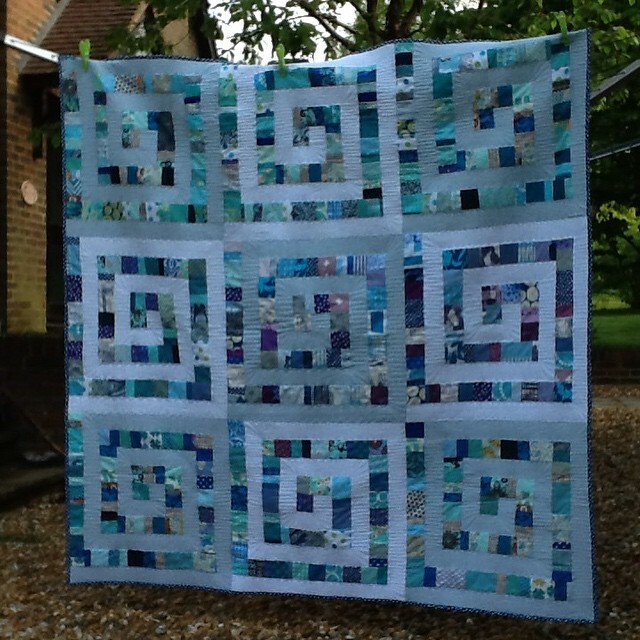 I designed this on EQ with lots of different but some similar blocks from the EQ6 library. Several blocks are repeated giving prominence to different parts of the block, each having a different name; eg churn dash, greek square, shoo fly. 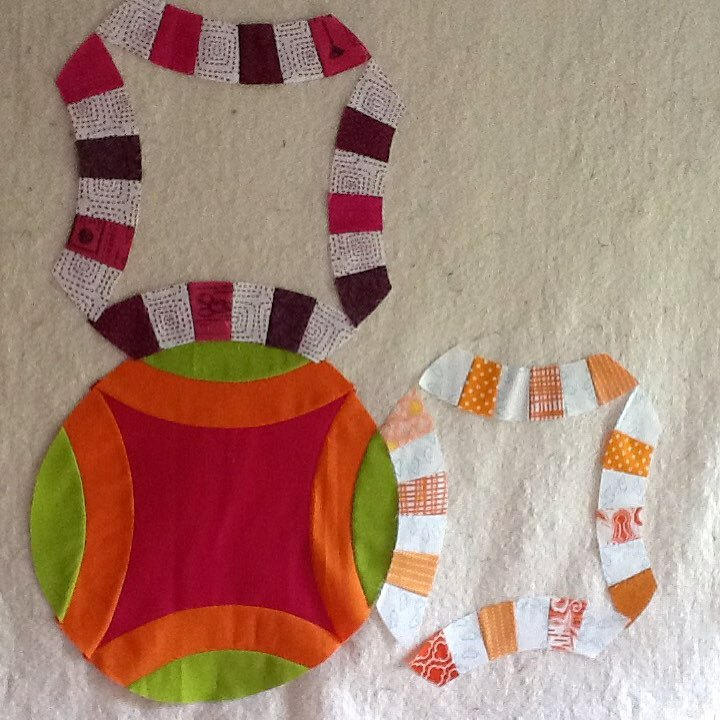 Some are repeated in a different size and/or colourway. 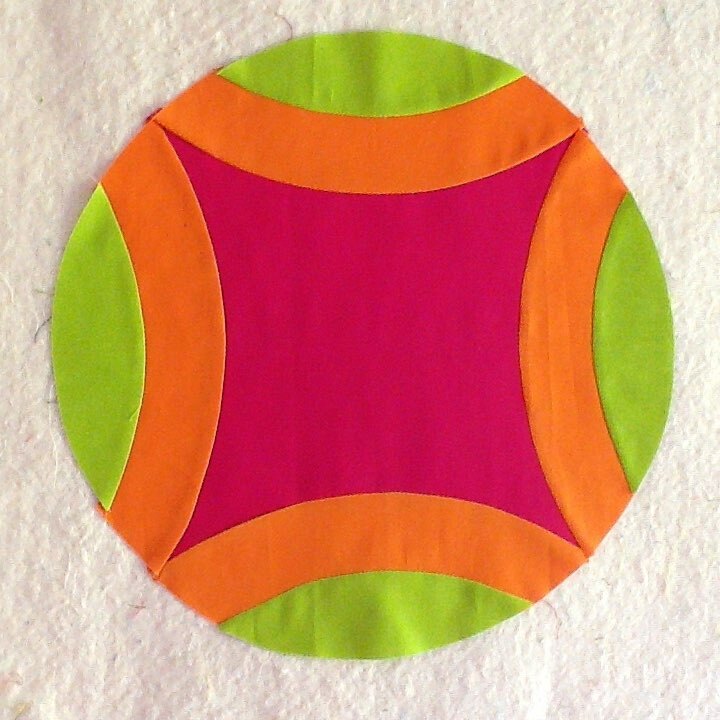 Several of the blocks have similar geometric elements in them; squares, triangles. 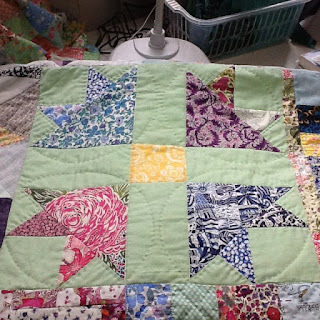 This was an attempt to make the quilt cohesive, to work as a whole, as I knew there would be lots of colour and pattern going into this quilt. I wasn't wrong! I have been posting about the blocks, with simplified instructions/measurements on how to make them, all the way through and have a page dedicated to it here. I may have lapsed a bit towards the end but this summer hols seems to be a good time to remedy that. So if you want you can make your own version. I have really enjoyed putting some of my Liberty fabrics together with solids and prints! 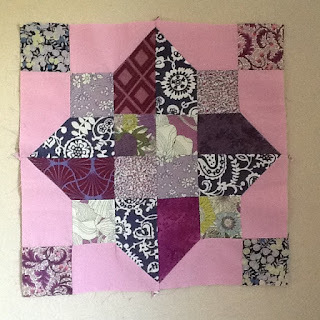 I think it works, both in the individual blocks and as a whole. 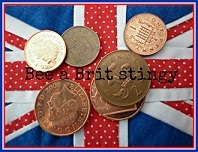 Up till now I seem to have been collecting Lilberty rather than using it! I had a bolt of Liberty fabric bought in a junk/antique shop for a very good price and used it on the back. 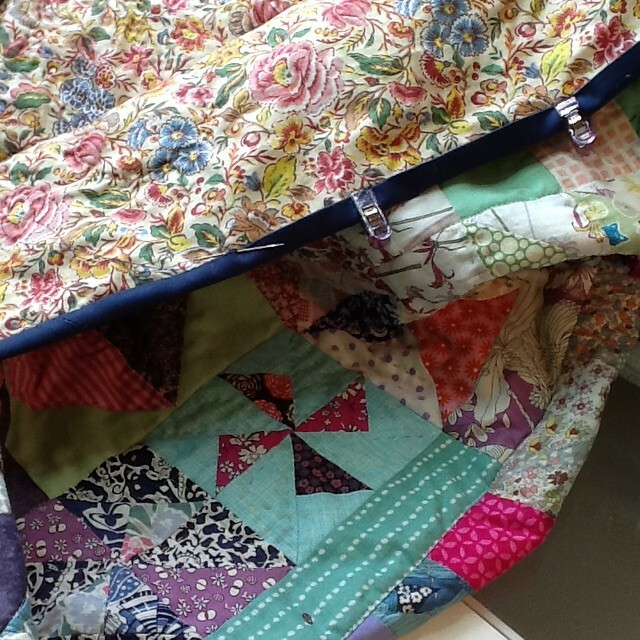 Here is a glimpse of it's floral beauty - think it might be a lightweight curtain fabric rather than the lovely Tana lawn used elsewhere. ....but having done quite a bit I decided I didn't like it, unpicked it, stabilised the layers with a bit of stitching in the ditch and then added some hand quilting details ! Like it much better now! And here it is in all it's chaotic glory! Some blocks and filler strips added, some block have moved from my original plan, but still true to my original vision and even better in real life I think! Almost forgot to link to my Q2 starter list! Well if you read this post I am not going to repeat myself! If you haven't then I invite you to do so first if you want to understand what comes next! 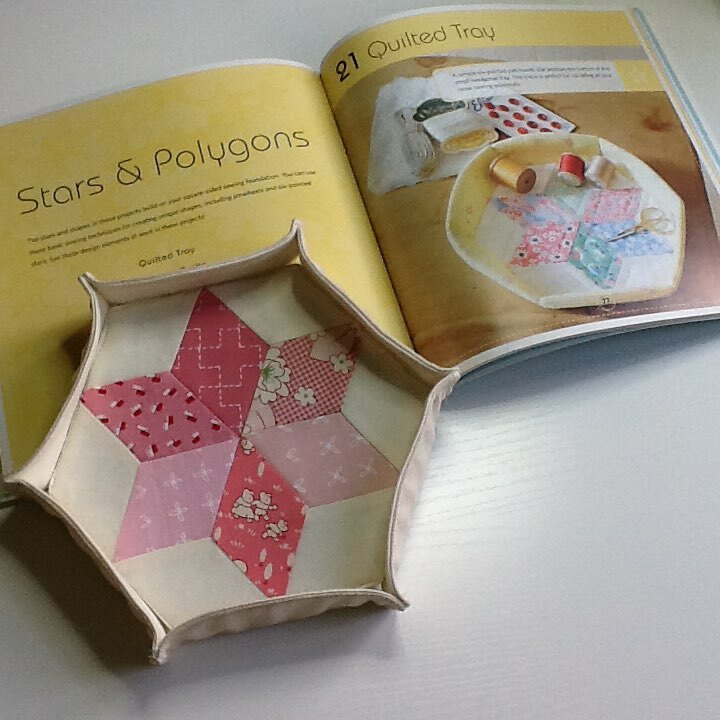 But you may prefer to just look at the pretty photos! 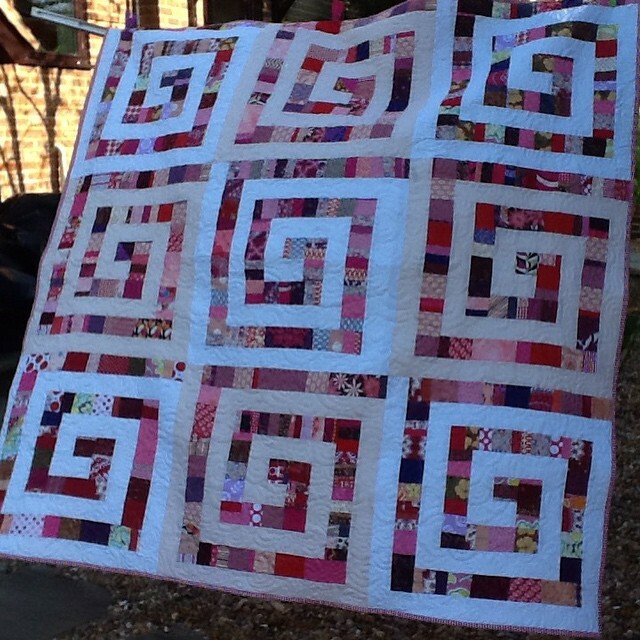 This is another quilt in the foody swirl series! I made this quilt with help from my lovely friend Jo who is part of my Siblings Together Bee, which I love and cherish! 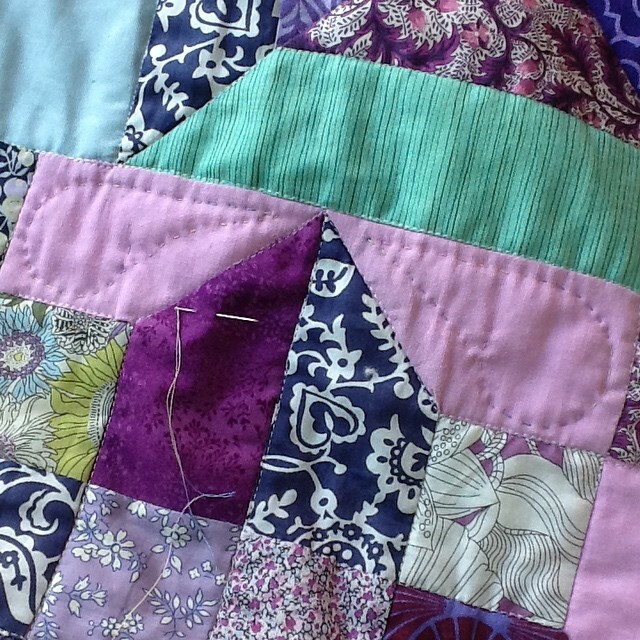 This is the Blueberry Pie version and Jo sent me all kinds of help to get this quilt started and finished. She sent me blocks, background fabric, filling strips, backing fabric and binding! Well she almost made it herself! Thanks so much Jo - I don't think I would have even started without your awesome help! Here are the other swirly ones! 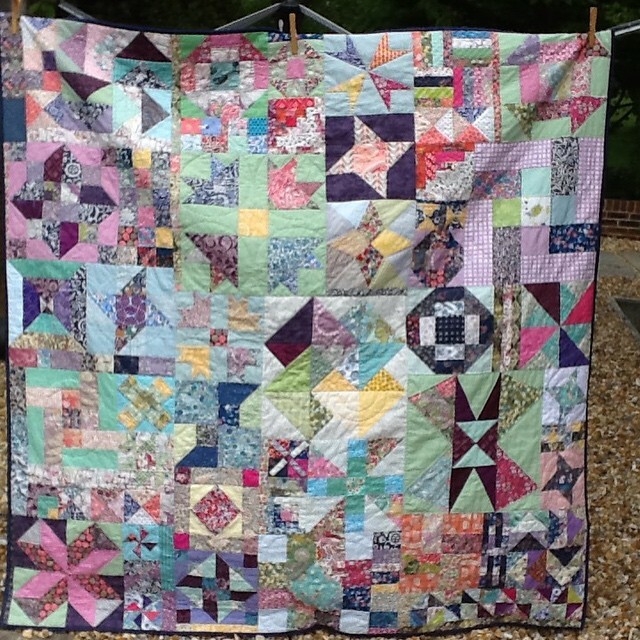 The reason for making so many similar quilts - not something I usually do - is to give a group of siblings in care in the UK a quilt that relate to each other! Another way to help them feel like a family with ties to each other in a crazy world that keeps them apart most of the time! Thanks to the charity Siblings Together they get to spend precious time together. Simple tutorial for this block/quilt here! 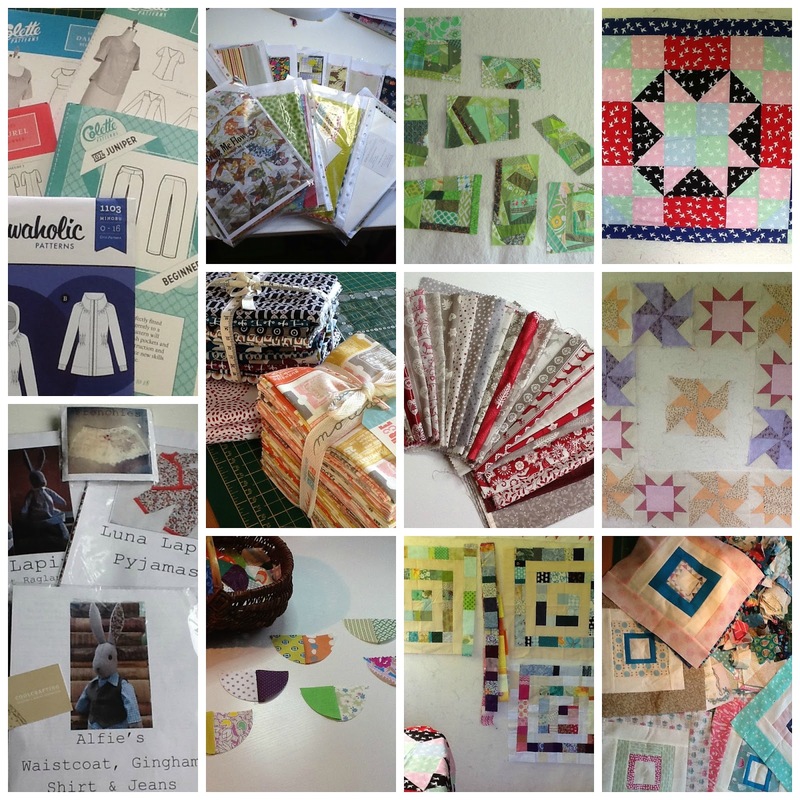 So I have been checking through the list on my Quilt Finishes 2015 page! 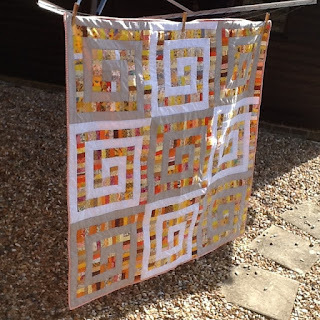 It seems I am quite good at displaying a photo of each quilt I finish there but not so good of late in blogging about them....naughty me! 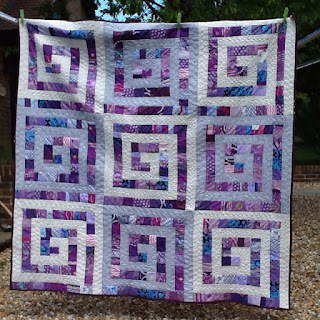 This one is called Victoria Plum Duff because it is purple and because I got some amazing generous help to complete this quilt from the lovely Victoria @sewgoclimbing. She really is a star! Victoria really loves purple! I am more of a green fan so thought she might be able to provide some purple scraps for the 'filling'. 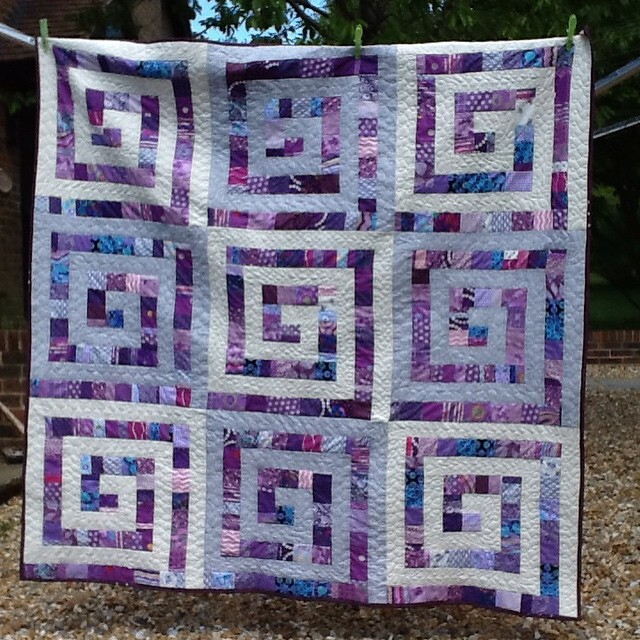 When I asked her she was preparing to go to Edinburgh for a few day but still managed to find the time to put all the 'filling' purple strips together ! Not only that, I had asked for scraps, and Victoria generously used up her scraps and stash - I cannot thank her enough! 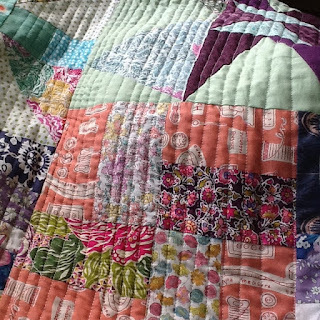 Making these Siblings Together quilts with help from lots of lovely people I have realised just how generous the quilting community is. So thanks my friend Victoria for this one! 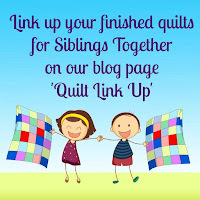 You can read more about the charity Siblings Together here, and read about the campaign some lovely quilty people have run this year, to provide a quilt for each child participating in the summer camps, here. 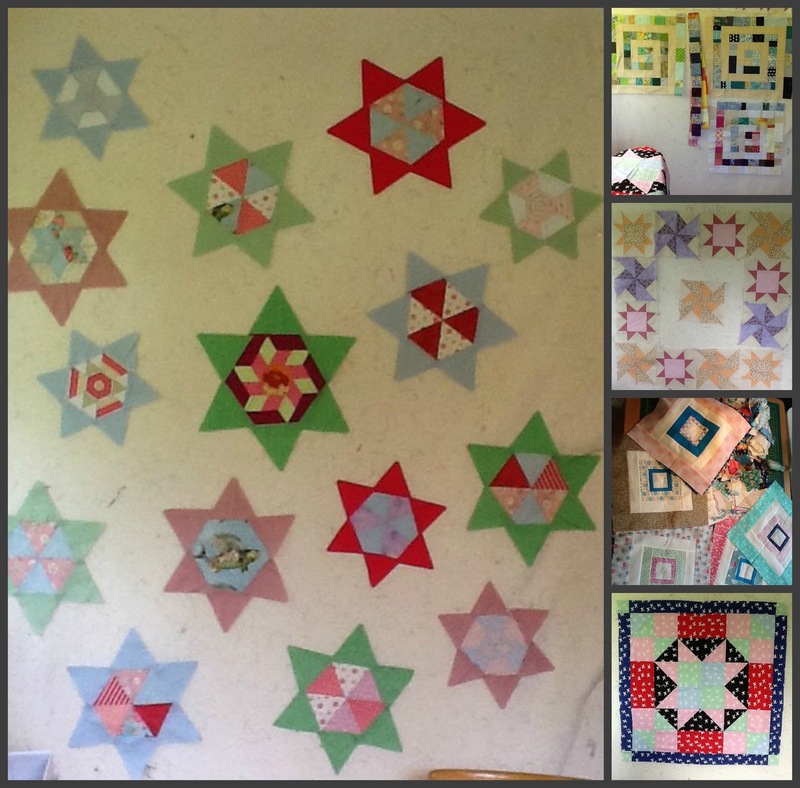 We had the target of 100 quilts and with lots of help have exceeded it! Well done everyone! Want to be a part of it next year? Leave a comment below and I will tell you the ways you can help!